Villa Valras is a smart villa with cozy terrace and garden on a small, secure complex with a large swimming pool. The holiday villa accommodates up to 4 people in 2 bedrooms and 1 bathroom. From the complex it's only a short 7 minutes walk to the the beautiful beach of Valras Plage. We are very pleased to offer superior self catering accommodation in Valras-Plage for you to enjoy everything the Languedoc has to offer from sun, beaches, fine food and wine to a wide variety of outdoor activities and beautiful countryside. 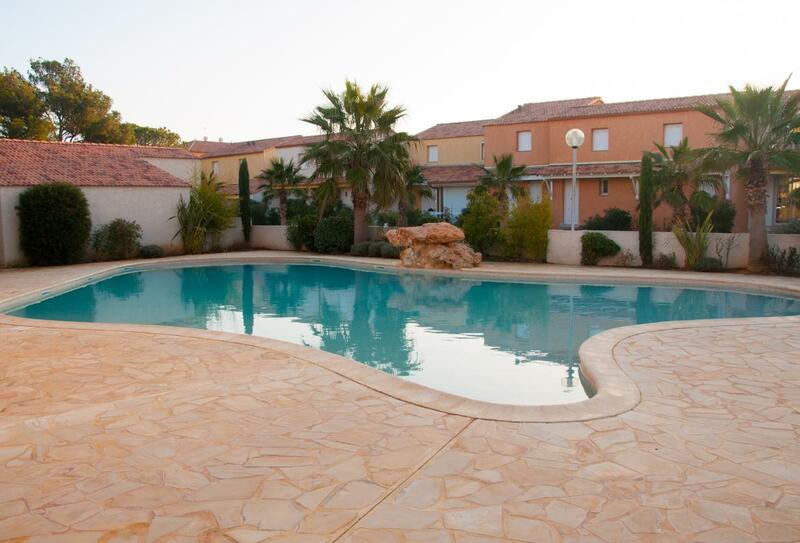 The villa, built in 2005, is situated in Le Clos De La Fontaine, a purpose built gated residence of 32 holiday villas around a private swimming pool with well established landscaping. Villa Valras offers light and airy accommodation for up to 4 people in ca 50m2 plus a small garden and cozy terrace. In addition to the extensive communal facilities the accommodation comprises: 2 bedrooms to sleep 4, a large lounge, a fully fitted kitchenette, a bathroom with bath and shower downstairs and a separate toilet upstairs. The villa has a large open plan style downstairs living area complete with sofa, sideboard, dining table and chairs, UK satellite, DVD and CD Player (bring your own CDs) and electric heating. Also downstairs is the bathroom with bath/shower and the kitchen, although small, is well equipped for your holiday with plenty of crockery and cutlery provided, as are cooking utensils. Upstairs are two large bedrooms approximately 2.6m x 3.2m, both with fitted wardrobes. One contains a king size bed whilst the other has two singles which can be pushed together to form a double bed. There is also an upstairs WC. The terrace facing the swimming pool is reached through the patio doors in the living room and has table and chairs. The communal swimming pool (normally open from early June to late September) is about 17m long and a maximum of 1.7m deep. With only 32 villas the pool is rarely crowded. For safety reasons it has a surrounding wall but there is no lifeguard on duty. The rear door opens onto the small garden which benefits from the evening sun and is equipped with a gas barbeque. There's also an ample private car park space in front of the house. It is situated some 800m from the South end of Valras-Plage beach (less than a 10 minute walk away), close enough to access all the amenities of the resort easily, but far enough away to enjoy the peace and quiet. 2 bedrooms, one with king size double bed and the second with 2 singles which can be pushed together to form a double bed. 1 bathroom with bath, shower and WC. Separate WC upstairs. Spacious lounge area with sofa, TV with UK satellite channels, DVD & CD player. Kitchen equipped with fridge freezer, combination micro-wave/grill/convection-oven, ceramic hob, dishwasher and washing machine. Dining room seating for 4. TV, DVD, CD player (please bring your own discs) and board games. Patio - covered and tiled. The villa makes an ideal base for relaxing, sampling local food and wine, exploring the old French towns and countryside of the Herault and Aude regions or enjoying the many local activities. The resort of Valras Plage is a classic French Mediterranean resort situated about 15 miles south west of Cap d'Agde. It enjoys some of the best weather in France with plenty of clear, dry days. During July and August, temperatures along the coast average around 28°C (82°F). The beach offers 4 kms of fine, clean sand with patrolled bathing areas during the season as well as beach activities such as volleyball, swings and zip-wire to entertain children. At the mouth of the river Orb you will find Valras Plage harbour, a safe haven for small leisure and commercial craft. Around the harbour and along the promenade in Valras are many fine bars and restaurants. These offer a full range from morning coffee, lunch of gallettes or crepes, ice creams, moules frites or just about anything else you might fancy for lunch or evening meal. Some also have live music during the evening. While in the harbour area why not sample one of the 70+ flavours of ice-cream from the parlour there. Situated at the other end of the beach about 8 minutes' walk from the villa is the casino which, as well as one arm bandits offers poker, roulette and black-jack. On Saturday evenings during the season, and less regularly out of season, it hosts regular cabaret spectaculars which are accompanied by diner. In town you will find an excellent selection of shops, restaurants, cafes, banks, a post-office and a well staffed tourist office which can give advice on local attractions and activities. There is also a fish market which sells the days fresh catch in the late afternoons and an open air market on Monday and Friday mornings at the Theatre de Mer near the harbour in the summer or town centre off-season, offering local food produce (vegetables, sausage, cheese etc.) as well as the local brightly coloured Mediterranean ceramics. As well as the local shops in the town Valras Plage, the area is serviced by a large Hyper-U at Sérignan, just 2 minutes drive out of the town towards Béziers. Various seasonal excursions are available from the harbour either for fishing or sight seeing. Sailing is available from the beach and there is a go-karting track just outside the village. Horse riding is available at nearby Portiragnes Plage and crazy golf at Vias Plage. Situated about 10 minutes drive from the A9 peage, Valras-Plage is an ideal base for exploring the Languedoc-Rousillon region including the Parc National du Haut Languedoc for beautiful mountain gorges and hiking, the Corbières wine region with its Cathar castles or the many fine beaches in the area. Whether you want to explore the diverse countryside, sample the local food whilst relaxing in an idyllic restaurant, taste wine at one of the many vineyards, relax wandering along the promenade or the long sandy beach or just chill out round the pool Valras-Plage is ideal. There are castles, abbeys, charming French villages and coastal resorts to explore as well as towns steeped in history such as nearby Beziers and Pezanas, or further afield the medieval cite of Carcassone, Montpellier, Nimes or Aigues Mort. For the active visitor there are a wide variety of walks in beautiful scenery from coastal paths to rolling hills and mountains of the Haut Languedoc. Alternatively you may prefer to go horse riding, hire a bike or take a boat on the scenic Canal du Midi or sail from the beach or at Lake Salagou. Budget airlines fly regularly to Carcassonne, Perpignan, Montpellier, all within 50 miles with Nimes and Toulouse also easily accessible. Béziers/Vias airport,20 minutes from the villa, is now open with Ryanair fying regularly from Stansted and Bristol, and from Luton during the winter. The TGV goes to Beziers and Eurostar operate a non-stop service from Waterloo to Avignon in high season. Approx 800m, about 8 minutes walk, from 4Km sandy beach with promenade in Valras Plage. - Superb, child friendly beaches and waterside restaurants and cafés 7 minutes walk away. - In the resort are seasonal activities - bicycle hire, tennis, go-karting, boat trips, sailing and windsurfing. - Horse riding schools - a choice in the area. - Many vineyards where wine can be tasted. - Béziers (20 minutes), historic town and capital of wine producing and rugby. Especially vibrant in August and during it’s famous Féria. Perhaps the best flower market in the whole of the south on Fridays in the beautiful tree-lined main boulevard. - Roquebrun (called "Little Nice") with its bathing river with beach and superb Mediterranean garden to visit. - Pézenas - City of Molière with an exceptional architectural heritage. Numerous arts and crafts artists with workshops open to the public. Large market every Saturday morning. To make the most of the area, a car is essential and makes transfers from the airport straight forward. Depending on the airport of arrival, these can be hired from the usual international companies such as Hertz, Europcar and Avis or local ones. The hire can be arranged either using your airline's preferred car hire company or direct with the hire company. You may also like to try specialist car hire agents such as Holiday Autos or Auto-Europe. For those wishing to drive the Millau bridge (taller than the Eiffel tower) over the River Tarn is now complete and makes the drive south much faster than before. Use viaMichelin (http://www.viamichelin.com) to plan your route. Ferry companies operating to the French channel ports include P&O Ferries, Sea France, Brittany Ferries or Hoverspeed as well as the channel tunnel with Eurotunnel. For advice legislation e.g. about carrying reflective vests and warning trianges in France see compulsory equipment and also the page on France and Monaco for more general advice and tips, both on the AA Web-site. Alternatively as a passenger on the TGV you can now get to Beziers just 15 minutes away. Linen and towels can be hired at £15 per person. Refundable security deposit of £300. Bookings from Saturday 4pm to Saturday 10am but arrivals and departures can be arranged for any day within the week booked. Car hire recommended for accessing Valras-Plage and making the most of this scenic area. Pool opens early June and closes end September. Normally available for rent all year round. Equipped with heaters for winter use. Short breaks may be available in low season so please enquire. Visited by one of our team, highly recommended. We are Nick and Val and our villa is a 2-bedroom house on a small development that we bought off-plan in 2004. We had previously visited the Languedoc and fell in love with the area so decided that we wanted to spend more time here. We previously stayed in an old conversion and that was enough to convince us that we really wanted something modern, insulated and warm in the winter! We chose Valras because of its beach, the multitude of activities available and particularly the fact that it is a real town with people living in it year-round. The house itself has a king bedroom and a twin, with the living room and kitchenette open-plan. It has a terrace at the front which overlooks the shared pool, and a small back garden with room for a dining table and a BBQ overlooking the countryside. The fact that it is well heated means that we can welcome guests throughout the winter. We love strolling along the promenade early in the morning or with the sun setting behind us. From the gorgeous long, sandy beach you can see the mountains of the Albères, or the foothills of the Pyrenees, where they reach the Mediterranean just over the border in Spain. In the other direction, you can see the small cliff that marks Cap d'Agde. It's also really easy to get to places from here as we are just 10 minutes from the A9 motorway and 3.5 hours from Barcelona. All in all, we are so pleased we bought this villa and hope that you will love it as much as us.
" The property description and photos were accurate and matched our expectations. It was good value for money and the general quality of the equipment in the property was good. It was clean and the booking procedure and service was very good. "